The dominance of digital advertising has been overstated, particularly in the automotive industry. Powerhouse companies like Toyota and Fiat Chrysler continue to spend big bucks on television ads and other mediums because they produce results. The auto industry does lead in the use of digital advertising, but it invests more in other, more traditional modes. Those types of advertising still produce results, delivering a healthy return on the advertiser’s investment. The industry needs to blend the old ways with the new. Television still rules in the industry, with auto companies spending approximately $11 billion on TV ads in 2017, outpacing all other industries. Some experts question whether these ads really work, but the proof is in car sales. For instance, after the famous (or infamous) Matthew McConaughey Lincoln MKC ads aired, the company saw the strongest October sales they’d had in a decade. Television ads work best to move viewers into the “consideration” phase, leading them to research the car before actually visiting a dealership. Radio ads are another cost-effective, traditional way to generate car sales. In fact, radio reaches 90 percent of Americans every week, many during their daily commute. The right local or national “drive time” car ad can literally steer potential buyers into the dealership on their way home. Nielsen stats show that radio ads could generate as much as 17 times the financial investment, making them a winner in the ROI department. Automotive purchases are a local transaction. Many consumers do their initial research online, but they don’t stop there. They want to keep their purchases local, so they eagerly search their local paper or shopper for area offerings and specials before heading for the car lot. Some dealerships have begun cutting back on print ads, but studies show that move is ill-advised. Automotive businesses increase the overall effectiveness of ad campaigns by 1.7 times when they advertise in newspapers. Auto dealers would do well to maintain or increase their print presence. Outdoor advertising can do something that digital ads can never do: capture buyer attention without much competition. Even better, outdoor advertising can capture the power of digital by incorporating digital displays, sound and video. Billboard advertising is still the most popular form of outdoor advertising, but automotive dealers are also seeing success from transit advertising, wraps and street furniture. Traditional advertising forms still trump digital ads in the auto industry, but those numbers are changing. In 2017, the industry was expected to spend 17.6 percent of their advertising budgets on these ads, with the percentage increasing by double digits through 2021. Auto dealers and manufacturers should employ digital ads, but they shouldn’t abandon other ad forms just because the trend is toward the internet. Digital advertising is on the rise, but it doesn’t replace the power of traditional modes, such as television and local print ads. Consumer trust is highest for print ads, television ads, radio ads and outdoor ads. Digital ads still lag behind these tried-and-true forms. Dealers need to strike a balance between the multiple ad forms available to them. They should explore the advantages of digital promotion, but know they will lose sales if they abandon their old advertising friends. The industry still needs to invest in Super Bowl ads, newspaper spreads, and flashy billboards to get their message across. As such, Tier10 delivers messages to targeted audiences through a combination of in-market mediums. The multi-channel approach is designed to stretch ad dollars, increase the frequency of message and convert drive customers to dealerships. Fully integrated across multiple mediums, Tier10’s campaigns communicate clearly, consistently, and credibly to produce a higher response rate and greater return on investment. 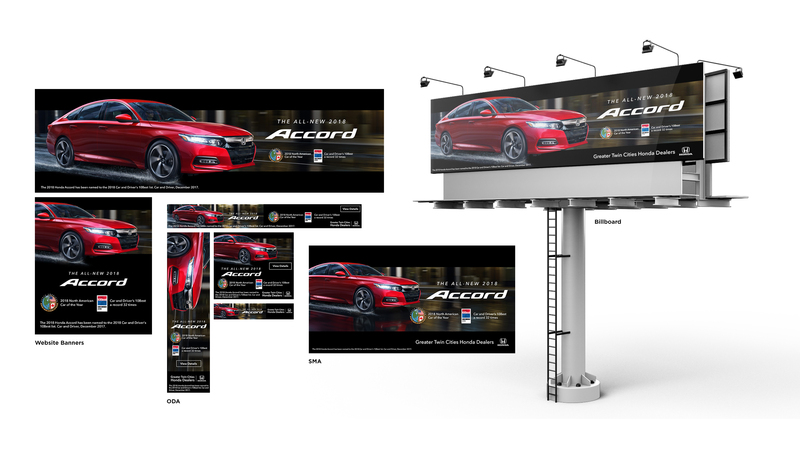 To introduce the all-new 2018 Accord, Tier10 created regional commercials, billboards, print ads, and a mix of digital assets. Error - Error validating access token: Session has expired on Tuesday, 06-Feb-18 09:00:00 PST. The current time is Thursday, 25-Apr-19 13:00:24 PDT.